A recent student research project has led to safer soil in Liberty City. Danielle Goveia has long been concerned with lead contamination in urban soils and how it could cause human toxicological problems through urban agriculture. Lead is a naturally occurring element that can be harmful to humans when consumed by inhaling or ingesting food grown in contaminated soils. While working on her master’s thesis as a student in the Department of Earth and Environment, Goveia decided to research soil in Liberty City, a low-income community of more than 5,000 families. 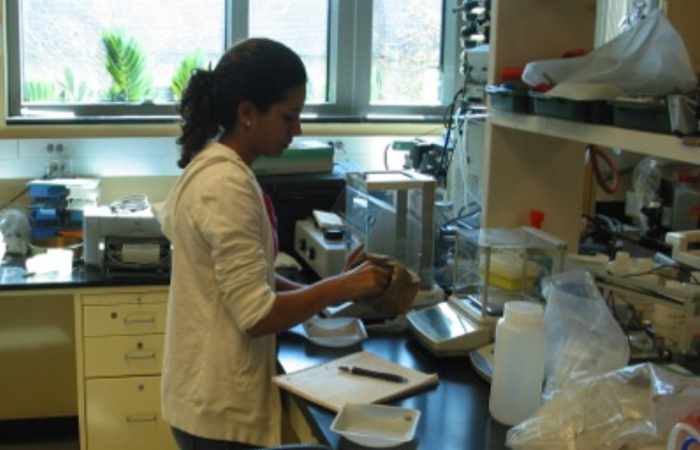 Danielle Goveia conducts research in a lab. Using soil from an organic farm as a control and Malabar spinach, Goveia grew the plants in a greenhouse. She chose the spinach because lead tends to accumulate in leafy vegetables more than other plants. According to Goveia, the results from her greenhouse experiment showed the highest concentrations of lead were in the roots, which are non-edible in Malabar spinach. Lower concentrations were found in the plant’s edible tissues. Goveia, together with her thesis professor Krish Jayachandran and the FIU Office of Engagement, presented the research findings to members of the Florida Department of Health in Miami-Dade County. Jayachandran says county officials responded immediately to address the areas of concern, and follow-up testing shows no signs of contamination. Goveia graduated with her master’s degree in 2013. She now works as a science interventionist at West Miami Middle School. She works with teachers in the classroom, providing one-on-one assistance to students who need it. She plans to pursue a career in public health. There should be more people like Goveia. Too bad the the Health Department is sleeping on the job. Our tax dollars should go to Goveia instead.